We are excited to team up with our fellow StudioWed Atlanta stationer, Luxe Expressions, for an afternoon of fun creating DIY Bridesmaid Invitations. 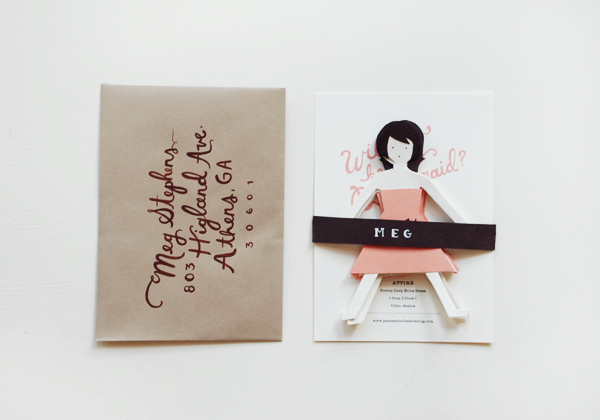 We thought it would be great to continue with the Paper Doll theme for this Sunday’s Inspired Bride event at StudioWed. We found this idea on One.Simple.Addition’s blog displaying a DIY (Do-It-Yourself) project originally designed by Rifle Design. Debra from Luxe Expressions, put her creative twist to the design. For brides who have yet to invite their best girls to be a part of their special day, this is a cute, creative and personal way to share their sentiments. It’s not too late! Register at http://studiowedinspired.eventbrite.com/. ← Fall Styles, Stationery Design Wow!